Marriott International has announced landmark plans to open a new hotel that will contain three of its brands under one roof in Nashville, US in 2018. The first-time venture, which is estimated to cost £102m, will be located in Nashville’s popular SoBro neighbourhood and will consist of 470 rooms. 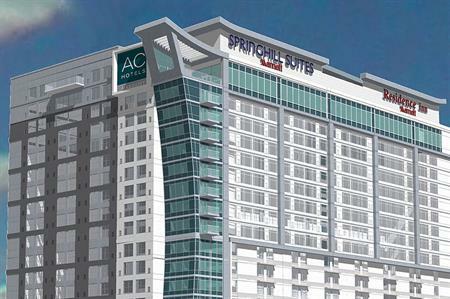 The 21-storey building will merge Marriott’s AC Hotels by Marriott, SpringHill Suites by Marriott and Residence Inn by Marriott brands, with each operating 209, 125 and 136 rooms, respectively. While the hotel will consolidate back-of-house operations, the building will wear three separate brand logos and will aim to offer three distinct hospitality experiences. The hotel company currently operates 52 'dual-brand hotels that combine two Marriott brands, including the Courtyard and Residence Inn in New York’s Times Square.